The University of New England will welcome more than 1200 prospective students from schools across the region on Friday, all eager to learn about study and career options at UNE’s Open Day. UNE Manager Market Engagement Sarah Wilson said a record number of pre-registrations from schools shows the continued strong interest from regional students in studying at UNE. “More than fifty schools have registered this year from as far afield as Noosa, Collarenebri, and Great Lakes, with half of those opting to stay overnight. “Students coming to Open Day are very interested in the residential college lifestyle, offering a balance between academic and social support as well as convenient access to all of the important facilities. “Open Day is an opportunity to tour the colleges as well as the main campus, attend information sessions and discuss course options directly with lecturers and course coordinators. It’s also a really fun day with live music, food and activities. “Open Day is mostly about living and learning as an on campus student, it is also a valuable opportunity for anyone considering study by distance or online to get some great one-on-one advice. 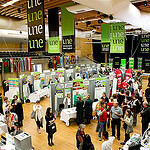 UNE Open Day 2014 starts at 7.30 am with breakfast in the residential colleges, followed by course advising and information sessions from 9am – 2.30pm. Tours of the academic campus will run during the day and shuttle buses will transport prospective students to Sport UNE and residential colleges. The day’s program will include a free lunch and entertainment. More information at une.edu.au/openday.